When it comes to your future as a homeowner, it’s important to understand the realities and consequences of short sales and foreclosure. Either option will affect your financial future, but one will insulate you from much of the long lasting financial detriment of a foreclosure! Better understanding of your options will put you in a position to make an informed decision about how to proceed. A short sale is always a far better option than losing the property to foreclosure! In a world where creditworthiness and personal finances impacts credit scores, job prospects, and even current employment status it is imperative to consult a qualified short sale expert to assist you with foreclosure avoidance. 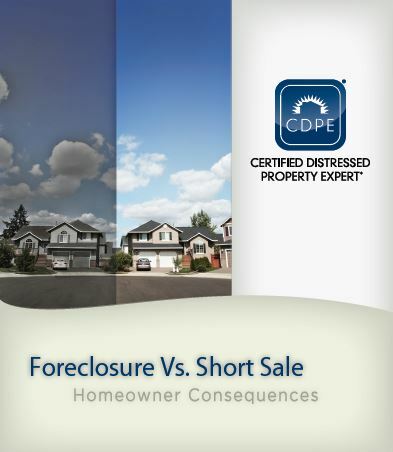 Short Sale Experts, Inc is offering you a FREE Special Report entitled “Foreclosure Vs. Short Sale – Homeowner Consequences” which clearly defines the benefits of a short sale vs. the pitfalls of losing your home to foreclosure. Download the report, read the stories, and then contact me for a free, confidential consultation.